By far the most popular ATXGeek post of the past year has been "Dell Inspiron 3050 Micro Teardown" which kicked off an active comments-based dialog concerning upgrade and modification options for Dell's nicely-priced, micro-sized system. The comments for that post now exceed 350 entries so it's time I waded through all the great contributions to summarize some things we've learned in the 9 months following the 3050's launch. I won't attempt to include all new info in one post. Instead, I'll begin with the top item of conversation these past 9 months: that elusive SATA cable. Replace the supplied 32MB SSD module with a larger module -- up to 128GB confirmed to work but keep the length down to 42mm (OEM size) or 60mm. Scrap the supplied SSD module and instead use an internal 2.5 inch SATA drive. Use BOTH an internal SATA drive and an SSD module as a second drive (yes, that is confirmed to work). If you want to add an internal SATA drive you *must* get your hands on the required SATA cable (a.k.a. "interposer"). In the early days following the 3050's release much was made of this cable with various bits of misinformation given by Dell support staff attempting to be helpful but ultimately being (apparently) uninformed with regards to what the 3050 needed. Many people reported success in making slight modifications (trimming) to a similar HP cable while others reported frustration with the HP cable (cable hard to modify and/or won't stay in place). Finally it seems that Dell has an unadvertised cable (more on that, below) that appears to be just what everyone has been waiting for. Fellow geek Ken Olson shared the first photo (and part number!) of this cable and comment-contributor Belt Way confirmed the cable works (he ordered two cables) and provided additional installation photos. Thanks Ken and Belt Way! needed to connect an internal hard drive to the 3050. But... you still can't order it from Dell parts. The part is not listed on the Dell parts website (www.dell.com/parts). Instead, you must call Dell support and ask very nicely to have the part shipped. I say "ask nicely" since the part is not officially a 3050 part (e.g., not offered in any new 3050 system either stock or as an option). Ken was able to order his cable for only $2. You *may* also be able to have a cable shipped for free if the Dell support person treats it as a replacement/repair part. Thanks once more to ATXGeek comment-contributors Ken Olson and Belt Way for our first solid confirmation and photos on this Dell part. Additional photos from Belt Way are included, below. Hi Marlon.. just a quick comment on the onboard SSD size limits for the 42mm drive.. Dell says 128GB, but myself and others are running 256GB units from "MyDigital"(SuperBootDrive)with success.. also using a 2.5" 1TB HDD as a secondary storage.. Thanks for the writeup.. the entire group on the original blog deserve heaps of praise.. and many thanks to you for starting it all..
Any word about the max size for the 2.5 sata drives? By the time you fill up a 1TB SATA drive.. it will be out dated and worn out.. don't imagine a bigger capacity drive will last any longer.. unless you were to spend big bucks on a large capacity Solid State Drive to fit that 2.5 bay..
FIXSTAR has a 6TB SSD in the 2.5 form factor, but sell the 1TB's for close to a grand.. Think I could wear out a few 60.00 spinning discs before spending that kind of dough.. got to wonder how much they will go for though.. I was asking being I currently have an Argosy media player with a 2 tb and was going to upgrade. The drive I have is 3.5 and it's almost full.I have ide drives that still work fine btw, they just don't get much use anymore. It's only a matter of time until this Argosy breaks, hence the reason why I bought this. I don't want to buy a 4tb drive that is only good for this unit (I have no need for 2.5 drives besides this) if it's not compatible. Just ordered 2 from Dell (just in case I mess 1 up)with free shipping. Not a problem, just hit the chat button for technical support and ask for that replacement part (HM06J). Downside, pay with cc, not paypal, they don't except paypal in chat purchases. Their payment is secured though. $1.99 a piece plus tax. Thanks so much. Just called and ordered 2. They were very nice about it. "Is this for the inspiron micro 3050 ? If so my advice is buy the hp cable mentioned on atxgeek from ebay/amazon – it will be cheaper and quicker to get. This is what my colleague did when I upgraded his 3050 to 2.5 ssd. As you can see, he didn't seem too enthusiastic about looking for the HM06J cable. His next email states that the HP cable definitely works, and that he's used it 'himself'. Which itself, seems to contradict his 'colleague' using one previously. "I am unable to supply this cable we have access to the dell warranty stock but they do not have this item in stock." So, long story short, it does not seem as though you can get the HM06J cable in the UK. If anyone in the UK has managed to get one, please let me know! I tried too and the rep first said they were not available, then told me she found something and proceeded to order me an incorrect part. I guess I'll try again in another week or so. Was able to order one this morning..
Did you order via technical chat? I was told that I need to contact regular Dell sales in the US. Yes, through Tech Support Chat.. gave them the service tag number and was treated as a replacement part.. as it was pinched when I was re assembling the case.. The two folks I have talked to in Technical Support chat have both referred me to the Spare Parts department at 800-357-3355, which I assume will be a dead end. What's the "trick" to getting them to help you? They seem dead set against taking any other action. I really need some help here: for the people who were successful, what number did you call, and what did you say, and were you passed off along the way or did it all happen through the support person? If you did it through chat, how did you do it? I really need to know when I have hit another dead end so I don't waste my breath. The frustrating thing is that in making this such a difficult operation, Dell is in fact creating a black market for this cable where the price of a $1.99 part is going to go through the roof, and that just makes me absolutely sick. I think a more frustrating aspect is realizing that Dell is losing money fielding support calls because this $2 part isn't available through the PARTS website. The company should mark it up to $10 or $12, stick it on the PARTS site and be happy with the bit of extra revenue. I have to imagine the reluctance to do this is based on Dell not wanting to field support calls on a no-profit-margin machine from people trying to add/install/boot from 2.5" drives. But yes, Dell could be making bank selling these at $10-$12, AND charging shipping on top of it. Going rate on Ebay seems to be around that for the used HP needs-modification version, so I would imagine people would be THRILLED to pay that for a new known-good one. The cable arrived today (and specificaly said I did not need to send back the "faulty cable", so, good) and now a spare 640 GB notebook drive I had kicking around (as a result of upgrading an older laptop to an SSD) is back in service. I note I had to take it out of Secure Boot in the BIOS to get Windows 10 to recognize the drive (even though the BIOS saw it the whole time) but once it did and it was repartitioned and reformatted I was able to turn Secure Boot back on and everything has been humming along since. I tried calling the parts dept. and was told they are out of stock on this item. Anyone having any luck elsewhere? What type of SSD can I install in this Inspiron Micro? 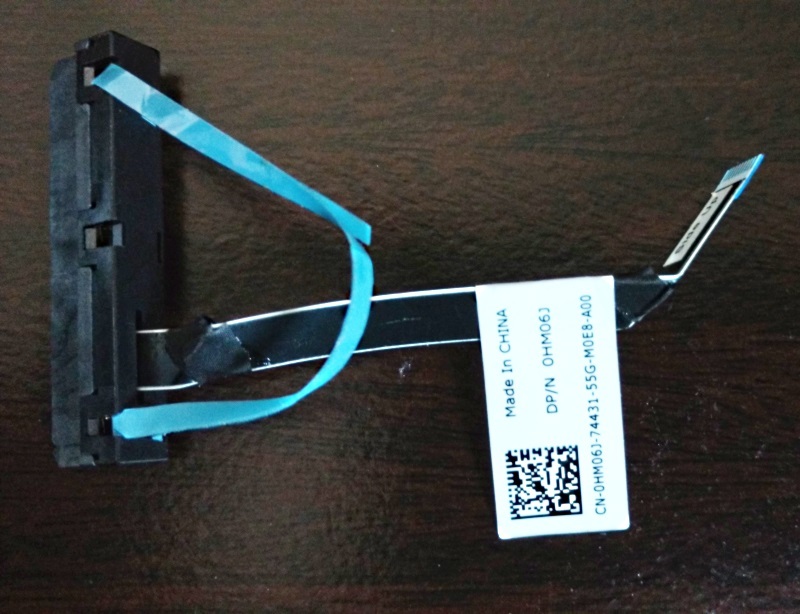 You can either upgrade the default SSD M.2 "drive on a stick" or add a standard laptop SSD (2.5-inch form factor) as long as you manage to order the SATA cable. Please be aware that upgrading the stock M.2 drive or adding a 2.5-inch drive is not a simple task. If upgrading the stock 32 GB M.2 form-factor drive, note that Ken Olson reports he is able to run a 256 GB M.2 SSD stick. Some previous reports suggested that the size limit for M.2 drives was 128 GB. We have not yet confirmed a size limit for SATA-connected drives. So I can install the SATA on top of the SSD that it already uses? Absolutely.. besides running a 256GB SSD, I also have installed a 1TB SATA drive for backup/storage.. also upgraded the ram to 8GB, a great little Micro now..
How did you upgrade the stock 32 gb m.2 drive to the 256 gb m.2 drive? Is there a special usb 3.0 adapter to attach the new drive to copy files over? Thanks. You can also run 2 monitors(extended desktop)by using the Display Port and HDMI at the same time.. Currently running it through an older "Integra" A/V preamp to a Projector @ 1080P, streaming and using the SATA drive for movie storage.. 100" screen and 8000W Audio system with 5 Crown amps and Klipsch speakers.. the 18" subs really round out the system.. you can "FEEL" the movies, like you were there.. then unhook it and put it in your coat pocket, set it up at a friends place.. I had a difficult time ordering 4 of these cables. The first chat session was told could order but out of stock and he was putting in a warehouse request. And I never heard back from the agent again. Chatted parts again and was able to get 4 at $1.99 free shipping. I just seems very hit or miss on getting Dell Parts ordered. Kinda frustrating. I did say in my chat session that I would need to return the 4 Inspiron 3050's I bought if I couldn't add a hd. I ordered 2 on Feb. 29th and was assured in stock to arrive March 8th. Still no cables, and getting all kinds of different stories. Not available - back ordered - waiting on vendor to ship - no such part - delivery date keeps updating - got an email to cancel - I declined and kept Oder active. Very frustrating to say the least. Everyone I talk to has a different story or a different Dept. To transfer me to. Dealing with Dell customer reps has been frustrating. I talked to almost 8 reps now, and no one knows how to order a part, they keep forwarding me to some parts department, and no one answers there. Who are you guys talking to? Tech support? Sales ? Without the cable, this machine is sort of useless for me. Benjamin Vijay = _HYDBenjamin_254892(Tech Support Specialist)is who helped me on the last cable.. going through "Chat" or "Sales" is hit and miss.. this is the standard "reply to" email address when they confirm delivery is scheduled.. and all the Techs use this addy.. maybe it is possible to contact him this way.. I finally received the two I ordered. 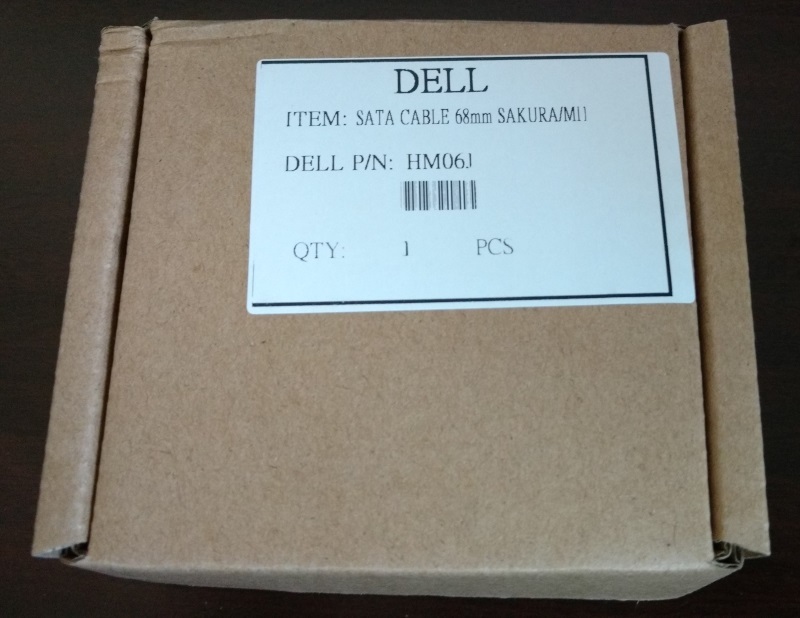 My online order status went from pre-production to showing up at my door.I had the HP cable working but feel better with the original Dell cable. Now I need to find great buy on another i3050 to use cable on second HTPC. Thanks Ken and to all on here for all the great information. Don't mention it was "Pinched", got told that was not covered under warranty and ended up back at Spare Parts where they are out of stock. Tried service chat 3 times. Total dead end getting shuffled to different departments and given different (useless) telephone numbers. Tried sales chat. Worked first time without a problem. So you can leave the existing drive in place, add a Sata SSD, clone OS to Sata, format 32gb m.2 and use as extra storage booting from Sata? Also, is there an advantage between replacing the m.2 with the 256gb MyDigital vs installing a 256gb 2.5 SSD provided one has the cable. I also have the HP cable that was never used but rather than mod it I am guessing best bet is to just spend the $2 for the actual one if I could get it . The Advantage of the M.2 SATA drive is that you can still install a 2.5" HDD/SSD. As far as the interface goes, they are both SATA 3 (6Gbps). A 2.5" Drive is generally cheaper and more compatible with other things should you decide to move it in the future. Just ordered mine. Tech Support Chat kicked me over to Sales (800-289-3355). Switchboard operator asked if it was personal of business, I selected personal. 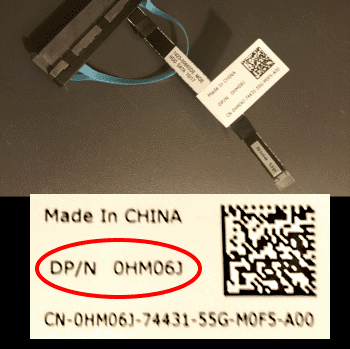 Once the agent was on the line, I asked to order Dell Replacement Part Number HM06J. He came back almost immediately and asked if it was a SATA/HDD cable. I verified, he processed the order, took my CC, and sent me a verification email with the order. The part is listed on the order as "Assembly,Cable,Serial Ata,HDD,SAKURA." $1.99+tax, Free Shipping. We'll see if it is the right cable in a week. They keep updating my order and moving the estimated delivery date out. They must not have the cable in stock yet. I don't mind as I am still waiting for a deal on a 480/500gb SSD drive by a reputable brand like Samsung. Whoever just posted about 91HDF please post back and let us know when you get that part and if it works. So tired of Dell telling me to go to a computer repair store for the cable. Moral of the story, avoid Dell at all possible. Only idiots pay for Dell services. Dell technical support has absolutely no training on these micro desktops. Don't expect anything useful from them. Every time I ask to speak to a support/sales supervisor, I was told no supervisor available. Gave them my number to call back, never got a callback. I am in the same boat as you. I have an order in the system from a month ago and they keep updating it pushing out the date. Bottom late, I do not think they have the part in stock nor can get it - its backordered probably from China. I just ordered 2 for $4.22 which included shipping. Was told they are out of stock, but expecting inventory within 30 Days. I purchased the HP cable on ebay and it worked after clipping the wings on the side. I would rather have the dell cable though. Copy and paste the above into the chat window and it will make it easier for them to find. I will post back if I actually receive them. Both are correct and work!!!! I was able to get the dell part but it doesn't seem to work. Does it need a separate power cable? 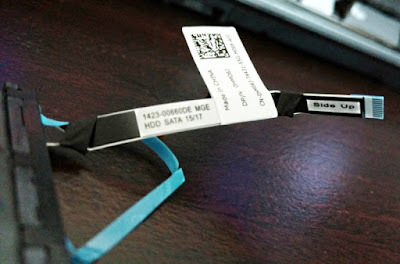 Still waiting for the SATA cable part name HM06J , Have been asked to speak to Alia Sharef. DELL PARTS didn't have it so eventually got confirmation from 'expired warranty' department and have paid 31 pounds for it.This was ordered the same time as desktop, which arrived on the 4th of May.When am I likely to get the cable? On the atxgeek site about the 3050, it said you need to switch from AHCI to ATA mode to use this cable. Does that also apply if you're using it for secondary storage? Another way to ask is, do you only need to switch to ATA from AHCI if you want to use the cable for your boot drive? After 45 days of waiting, Dell has finally shipped my HDD cable as of a few hours ago! I did not metion anything other than I need the following replacement parts. Ordered with no problem. Initially it was backordered 3 times and I got robo calls from dell saying that I had to approve the delay since it was back ordered. Thanks to everyone for all the hard work that went into this thread. I picked up one of these as an open box buy to use as a HTPC and a "Bastion" ssh host for my home network. Unfortunately it didn't come with a power cable/supply and after searching for a while on Amazon and other sites, I haven't been able to find a generic replacement power supply that I was 100% positive would fit the unit. I was wondering if anyone here had links to where I could find a generic or used power supply (hopefully for less than $30-$40 US). Thanks in advance! I noticed is the partition with windows on the M.2 is showing Boot Drive where the partition on the 950 where windows is simply shows 'Primary partition'. Do i need to somehow change the partition status on the 950 to get it to work? I am starting to think I just need to use it for storage and continue to boot from the M.2. I have spent all day messing with this thing. I have never had this issue with other systems where I have switched drives before. I used Symantec Ghost and it worked, I used the method you described and it fails like yours did. Ghost will image the whole hard drive with any partition included. You may have to turn off AHCI. I got on the phone with dell support. They were not able to provide with the original HM06J cable but they mention refurbished 1M9GY cable, have any one had any experience with this one? I was able to get the HM06J cable from dell, but was not able to connect it to the 3050 motherboard. I found the right slot, but it kept sliding out. Is there a trick to attaching the cable to the motherboard? ThX! I'm in Connecticut, USA and I purchased the 3050 for $99 during Dell's recent sale. After some back and forth with support, I was finally able to order the cable thanks to the specifics provided in this thread and just received it yesterday. Just ordered 4 tonight. They quoted me the $1.99 + tax + $6.99 shipping. I asked if I could order 4 to save on shipping and they sold me 4 and waived the shipping fee. Sweet. Thanks for posting all this great information. I'm sure it save me untold hours of grief and aggravation! I was able to order mine today. For such an insignificant cost you'd think Dell would have included it already connected or in the box. So I ended up purchasing the Dell OEM cable and tried doing the cloning process all over again but kept running into the issue were the System wouldn't boot with just the 2.5 256 GB SSD installed. I think spent two whole work days trying to clone my current OS and trying a clean install only to end up with the same problem, it won't boot pass the dell icon. The bios shows that it sees the new SSD, but not sure why it wont recognize the boot files and start windows 10. I even tried manually configuring the Bios to point to the boot file on the new HD and still got no where. No where in any of these write ups does it specify how to correctly upgrade from the m2 32 GB SSD to a SATA SSD. I know it's not my windows installation because I can get the system to boot from it when I have it plugged in via my USB external hard drive setup. I am left to believe there is a setting I am overlooking in the bios. Also, I noticed that this write up has an edit where it mentions that it's now possible to utilize the M2 SSD and the 2.5 SATA SSD at the same time? Anyone know how to configure this? OK, here we go again, I'm petty sure this will work too Dell Inspiron 5558 5559 SATA Hard Drive Adapter Interposer Connector Cable H5G06 you guys may find it here:http://www.ebay.com/itm/Dell-Inspiron-5558-5559-SATA-Hard-Drive-Adapter-Interposer-Connector-Cable-H5G06-/262709350245?hash=item3d2ab28f65:g:LgMAAOSwXeJYIL5s as I said it before Dell will not make of a cable something special. ebay it's plagued with this connector using different codes but if you look at the pictures they are all the same. Funny to me that Dell refer to this place for support, hey Marlon perhaps Dell will cut you a big fat check for your website's support lol! I purchased a 3050 several weeks ago when Slick Deals offered a rebate which I never got. Now, I've got a 3050 I'd like to upgrade with a 128 SSD I have laying around. But I must have a cable that is extremely hard to find! Making parts hard to find seems ludicrous to me. What does Dell gain by making upgrade parts hard to come by? It just makes folks like me mad! Some of the things these companies do is just crazy. I called Dell and the part is unavailable but the rep. said he would be glad to call me when it becomes available. Something is available on ebay but I don't trust it is the correct part. And where do you plug in the interposer cable when you get it? I could use some help (and some antacid)! Part is unavailable and they don't know when it will be. I ordered the other one from ebay so I hope it works. Well, this afternoon I received the HP Envy interposer cable that was said to work in place of the HM06J that our friends at Dell don't have available. Needless to say, the install did not go well at all. I suppose I need to get a new hobby. I just can't believe that business like Dell would make it so difficult to upgrade one of their devices!!!! Can someone please recommend a 2.5 SATA Hard Drive? I am okay with just 500G or 1TB. I just want to make sure it is compatible with the unit. I just ordered ten to Tennessee at $1.99 free shipping from sales chat, didn't give a Service Tag, only had to request part HM06J. The invoice says "Assembly,Cable,Serial Ata,HDD, SAKURA QTY 10". Expected to arrive within a week. I am looking to get this cable. Please let me know where to get it online. Appreciate your reply. Just tried to order from Dell and it's not a listed part according to their service rep.